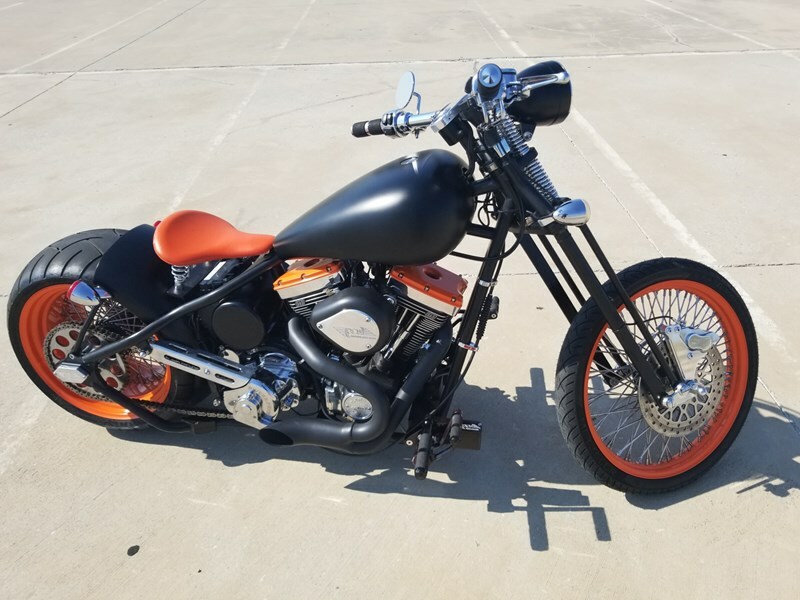 All Upgrades & Performance Tuning performed by Misfit Industries Dallas, TX: 2008 Custom Precision Bobber w/ 35 Degree Rake, Performance Tuned S&S V-Twin 96 cubic inch motor w/LSD 6 Speed Transmission & Dakota Digital Speedometer w/trip meter. Custom Powder Coated Headers, Trans Cover, and Wheels. NEW - EVO Spark Plugs, Twin Power Premium Battery FX, Chrome Oil Filter EVO, Air Filter, 23" Brake Line Stainless Braided, 26" Brake Line Stainless Braided, 36" Brake Line Stainless Braided, 10MM Chrome Straight Banjo Fittings, 10MM Chrome 35 Deg Banjo Fittings, Clutch Lever, Front Brake Master Cylinder and Caliper, Wilwood Disc Brakes with 11-1/2" polished S.S. rotors, 10MM Banjo Bolts Chrome, Chrome Seat Springs, Black Vinyl Throttle Cable 36", Black Vinyl Idle Cable 36", Intake Seals, Polished Stainless Rocker Top Bolt Kit EVO, Run/Stop/Start Switch, Custom Fuel Tank and Rear Fender, Custom Chrome Springer Front End 2" over stock with Custom Short Stub Exhaust, Upgrade to all Oil and Fuel Lines. Tires (New) Metzler 880 90/90-21 Front // Metzler 808 300/35 Z 18 Rear. Professionally crafted & cared for: Professional garage storage with monthly maintenance, scheduled ride time of 100 miles a month, 1 owner. Hello, I'm interested in your 2008 Aggressor. Hello, I'm interested in making an offer on your 2008 Aggressor. Hello, I'm interested in trading in my bike for your 2008 Aggressor. Hello, I'm interested in taking your 2008 Aggressor for a test ride.